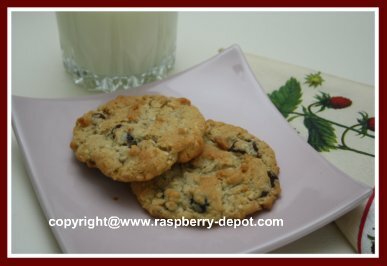 This healthy Oatmeal Chocolate Chip Cookies Recipe including dried raspberries, craisins, raisins or other dried fruit makes yummy, chewy chocolate chip cookies! 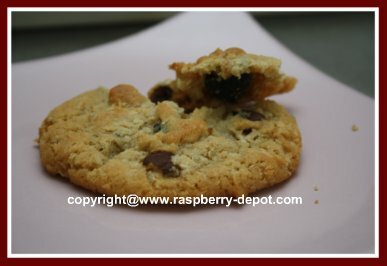 I make this recipe of chocolate chip cookies with oatmeal and dried fruit for our family again and again ... it is one of those "no fail" cookie recipes. This recipe makes about 4 dozen medium-large cookies. These cookies freeze very well. You can use some fresh, and then freeze the other cookies, and take them out as you wish, and pop them in your lunch for a great snack idea! Or, make them for an after-school snack treat for the kids! In a large bowl, with a fork, cream the softened butter and softened shortening until well blended. Add the brown and the white sugar to the butter mixture and mix with the fork, until well combined. Lightly beat the egg (with a fork), and mix into the above mixture. In another bowl, combine the flour, baking powder, baking soda and the salt. Add the dry ingredients to the butter mixture, and mix just until well combined. Add the coconut and the rolled oats, mixing with the fork, until combined. Add and mix in the chocolate chips and the dried raspberries. Drop about 1 /2" ball of cookie dough on a parchment lined cookie baking tray. Bake at 350° F for about 10 - 12 minutes or until the edges begin to turn a golden, light brown, colour. Makes about 4 dozen medium-large oatmeal chocolate chip cookies. If you cannot find dried raspberries at your local grocery store, you can, if desired, purchased them online at *Amazon.com. Click on the images below for more product information and customer reviews. If you own a food dehydrator, then you can dry your own raspberries or other fruit to add to cookies!